M51, also known as NGC 5194, is engaged in a close encounter with a nearby galaxy, NGC 5195, outside the field of view of this image. The companion’s gravitational pull triggers star formation in the main galaxy, as seen in the numerous, luminous clusters of young and energetic stars. 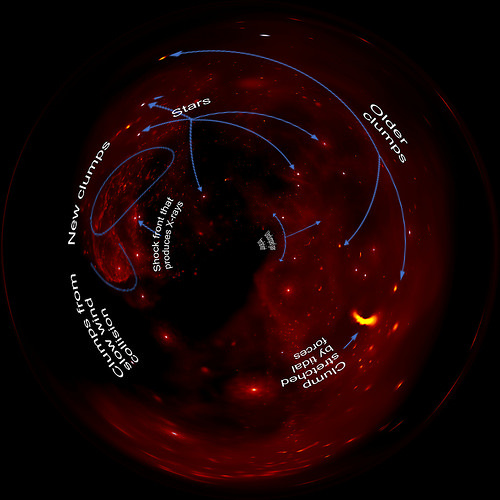 The bright clusters are highlighted in red by their associated emission from glowing hydrogen gas. 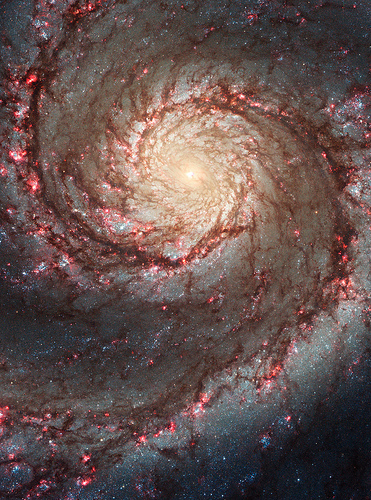 Along the spiral arms, dust "spurs" are seen branching out almost perpendicular to the main spiral arms. The large number and regularity of these features are not fully understood, suggesting that previous computer models of "two-arm" spiral galaxies are incomplete. 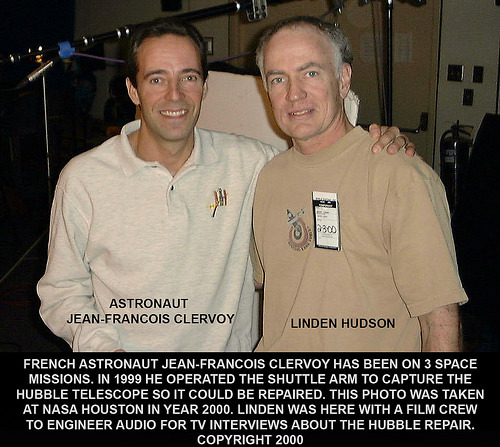 Photo taken by a fellow crewmember while Linden was working on a film crew as an audio engineer. This astronaut was a super nice guy. 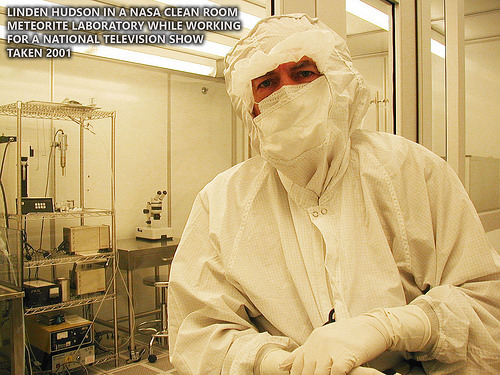 This is a photo of Linden Hudson at NASA. This image depicts a vast canyon of dust and gas in the Orion Nebula from a 3-D computer model based on observations by NASA’s Hubble Space Telescope and created by science visualization specialists at the Space Telescope Science Institute (STScI) in Baltimore, Md. A 3-D visualization of this model takes viewers on an amazing four-minute voyage through the 15-light-year-wide canyon. Take an exhilarating ride through the Orion Nebula, a vast star-making factory 1,500 light-years away. Swoop through Orion’s giant canyon of gas and dust. Fly past behemoth stars whose brilliant light illuminates and energizes the entire cloudy region. Zoom by dusty tadpole-shaped objects that are fledgling solar systems. This virtual space journey isn’t the latest video game but one of several groundbreaking astronomy visualizations created by specialists at the Space Telescope Science Institute (STScI) in Baltimore, the science operations center for NASA’s Hubble Space Telescope. The cinematic space odysseys are part of the new Imax film "Hubble 3D," which opens today at select Imax theaters worldwide. The 43-minute movie chronicles the 20-year life of Hubble and includes highlights from the May 2009 servicing mission to the Earth-orbiting observatory, with footage taken by the astronauts. 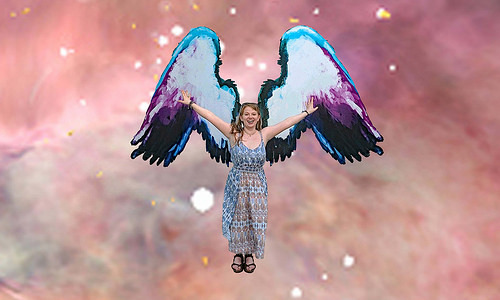 The giant-screen film showcases some of Hubble’s breathtaking iconic pictures, such as the Eagle Nebula’s "Pillars of Creation," as well as stunning views taken by the newly installed Wide Field Camera 3. While Hubble pictures of celestial objects are awe-inspiring, they are flat 2-D photographs. For this film, those 2-D images have been converted into 3-D environments, giving the audience the impression they are space travelers taking a tour of Hubble’s most popular targets. 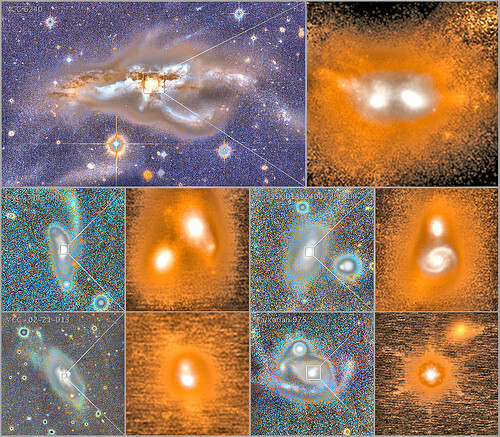 "A large-format movie is a truly immersive experience," says Frank Summers, an STScI astronomer and science visualization specialist who led the team that developed the movie visualizations. The team labored for nine months, working on four visualization sequences that comprise about 12 minutes of the movie. "Seeing these Hubble images in 3-D, you feel like you are flying through space and not just looking at picture postcards," Summers continued. "The spacescapes are all based on Hubble images and data, though some artistic license is necessary to produce the full depth of field needed for 3-D."
The most ambitious sequence is a four-minute voyage through the Orion Nebula’s gas-and-dust canyon, about 15 light-years across. During the ride, viewers will see bright and dark, gaseous clouds; thousands of stars, including a grouping of bright, hefty stars called the Trapezium; and embryonic planetary systems. The tour ends with a detailed look at a young circumstellar disk, which is much like the structure from which our solar system formed 4.5 billion years ago. 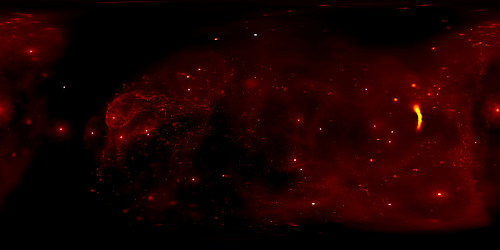 Based on a Hubble image of Orion released in 2006, the visualization was a collaborative effort between science visualization specialists at STScI, including Greg Bacon, who sculpted the Orion Nebula digital model, with input from STScI astronomer Massimo Roberto; the National Center for Supercomputing Applications at the University of Illinois at Urbana-Champaign; and the Spitzer Science Center at the California Institute of Technology in Pasadena. For some of the sequences, STScI imaging specialists developed new techniques for transforming the 2-D Hubble images into 3-D. STScI image processing specialists Lisa Frattare and Zolt Levay, for example, created methods of splitting a giant gaseous pillar in the Carina Nebula into multiple layers to produce a 3-D effect, giving the structure depth. The Carina Nebula is a nursery for baby stars. AIRS’ global carbon monoxide measurements are important because scientists can monitor the transport of fire emissions around the globe on a daily basis. Previously, carbon monoxide measurements came from satellite instruments that saw only part of the Earth each day or from weather balloons. Prior to AIRS, scientists had to integrate those observations with computer models to infer the day-to-day impact of fire emissions on the atmosphere. AIRS provides daily, global coverage. AIRS also measures some of the key atmospheric gases that affect climate, including ozone, methane, and dust and other aerosols. Tropospheric CO abundances are retrieved from the 4.67 m region of AIRS spectra as one of the last steps of the AIRS team algorithm. AIRS’ 1600 km cross-track swath and cloud-clearing retrieval capabilities provide daily global CO maps over approximately 70% of the Earth. 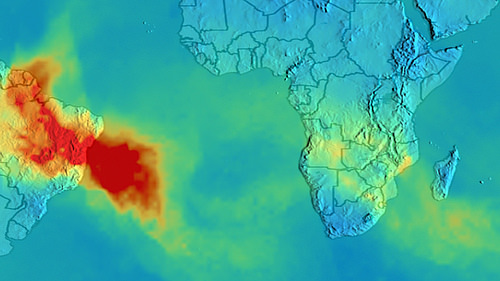 The streak of red, orange, and yellow across South America, Africa, and the Atlantic Ocean in this animation points to high levels of carbon monoxide, as measured by the Atmospheric Infrared Sounder (AIRS) instrument flying on NASA’s Aqua satellite. The carbon monoxide primarily comes from fires burning in the Amazon basin, with some additional contribution from fires in southern Africa. The animation shows carbon monoxide transport sweeping east throughout August, September, and October 2005. More images of this event and an animation can be found on the NASA/Goddard Space Flight Center Scientific Visualization Studio web site.